Riding on a plume of fire from its Atlas V rocket, the NASA mission Juno launched at 16:25 UT (12:25 Eastern US time) on its way to Jupiter. 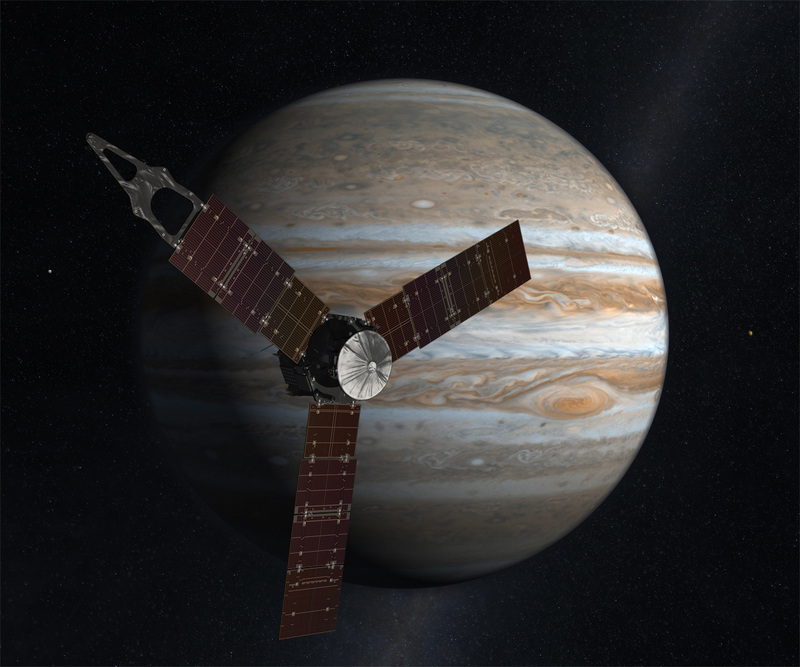 Juno will take 5 years to get to Jupiter, taking the 3 billion kilometer scenic route. In October 2013 it will actually pass the Earth once again, using the gravity of Earth and its motion around the Sun to steal a tiny bit of our energy and propel it to the outer solar system. From here, it will take a wide elliptical path to the giant planet, which orbits the Sun 5 times farther out than the Earth does. That’s why it takes so long. Once there, it will orbit Jupiter for about an Earth year (how cool and science fictiony is it be able to say that? 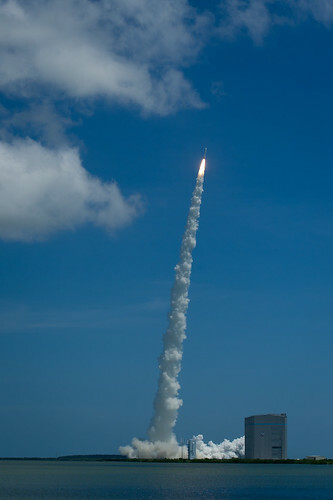 ), taking its measure of Jupiter’s atmosphere, composition, surrounding environment, and magnetic field. It’s equipped with microwave, ultraviolet, infrared, and visible light detectors (which means very high-resolution pictures!) as well as other instruments to try to understand this enormous planet. Interestingly, Juno is using solar panels for power; sunlight is only 4% as strong at Jupiter as it is here on Earth, so it’s only been through major advances in solar power generation technology that allows this (plus amazing work on getting the spacecraft instruments to use very little power). Cassini, for example, uses radioisotopes (plutonium) to generate electricity for its instruments to study Saturn. 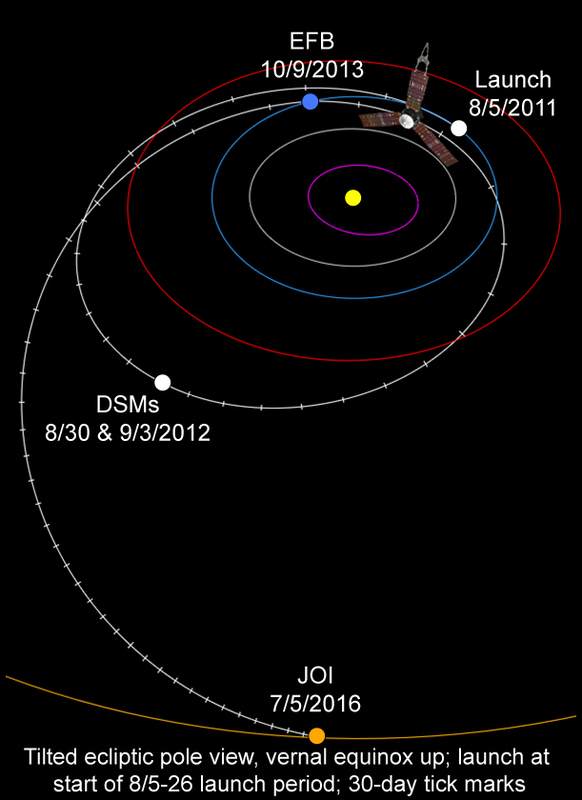 At this point, we probably won’t hear much more about or from Juno until October 2013 when it swings by us once again. I expect we’ll get some fun new pictures of the Earth when it does. But after that it’ll be three more years of coasting the cold, dark lanes of space before it gets to Jupiter. And once there, I’m hoping it will do as much for our knowledge of our solar system’s largest planet as all the previous missions combined. That’s the way these things tend to go: the more we do, the more we learn, and the more we find we have to learn. And on a personal note, it’s really nice to be able to say that humanity now has a new spacecraft on its way to Jupiter. It’s been a while. – Phobos passes Jupiter, as seen from Mars!